CBI - China: Day 47 of 154 of the Japanese Invasion of Manchuria. Spain: Day 110 of 985 of the Spanish Civil War. CBI - China: Day 15 of 29 of the 1st Battle of Suiyuan. Spain: Day 475 of 985 of the Spanish Civil War. CBI - China: Day 120 of 2,987 of the 2nd Sino-Japanese War. Day 83 of 106 of the 2nd Battle of Shanghai. Day 64 of 70 of the Battle of Taiyuan. Spain: Day 840 of 985 of the Spanish Civil War. CBI - China: Day 485 of 2,987 of the 2nd Sino-Japanese War. Day 23 of 81 of Japan's Operation GUANGDONG. CBI - China: Day 850 of 2,987 of the 2nd Sino-Japanese War. Atlantic: German U-99 sinks the armed merchant-cruiser HMS LAURENTIC off Iceland. While being rescued by the HMS PATROCLUS, U-99 sinks her too. ETO - UK: Day 59 of 258 of the Blitz. MTO - Greece: Greek troops trap the Italian 3rd Alpine Division taking 5,000 prisoners. British troops arrive in Greece. East Africa: Day 147 of 537 of Italy's East African campaign in the lands south of Egypt. CBI - China: Day 1,216 of 2,987 of the 2nd Sino-Japanese War. Day 355 of 381 of the Battle of South Guangxi. CBI - Thailand: Day 34 of 221 of the Franco-Thai War (Vichy France vs Thailand). USA: "Angels of Mercy," written by Irving Berlin for the American Red Cross, becomes the official Red Cross wartime song. All profits from the song are assigned to the Red Cross. Russian Front - Finland: Day 128 of 142 of Operation SILVER FOX, a joint German-Finnish campaign to capture the Russian port of Murmansk in the Arctic. Russian Front - Finland: Day 126 of 140 of Operation ARCTIC FOX, a joint German-Finnish campaign against Soviet Northern Front defenses at Salla, Finland. Russian Front - Finland: Day 135 of 164 of the Battle of Hanko. The Soviets will be forced off their leased naval base. Russian Front: Day 135 of 167 of Germany's Operation BARBAROSSA. Russian Front - North: Day 57 of 872 of the Siege of Leningrad. Russian Front - Center: Day 33 of 98 of the Battle of Moscow. Russian Front - South: Day 5 of 248 of the Siege of Sevastopol, Crimean Peninsula. MTO - Libya: Day 208 of 256 of the Siege of Tobruk. The RAF attacks Benghazi and Tripoli. East Africa: Day 512 of 537 of Italy's East African campaign in the lands south of Egypt. CBI - China: Day 1,581 of 2,987 of the 2nd Sino-Japanese War. Atlantic: British merchant seaman Duncan Scott-Ford is hanged at Wandsworth Prison for supplying the Germans with shipping information. Duncan Scott-Ford was on board the SS FINLAND, which arrived in Lisbon on 10 May 42. A few days later he was met in a bar by a man who offered him 1000 Portuguese escudos if he would confirm the rumor that all British ships had been ordered to be in port on 28 June. Scott-Ford undertook to try to find out and to meet again the following day. Although unable to find confirmation, Scott-Ford met with him and another man who appeared to be his superior. Confessing to not having supplied the information wanted, the group nevertheless discussed issues such as the state of morale in Britain, public opinion of Winston Churchill, and the extent of air raid damage. Duncan Scott-Ford was given a 1000 Escudo note and another meeting was arranged for a few days later. At this meeting, Scott-Ford was asked to obtain more information about the location of British minefields, the arrival of American servicemen in Britain, and such. His ship sailed the next day and all the crew were interrogated on arrival at Liverpool to ask if they had been approached by German agents. Scott-Ford stated that he had been approached but had not cooperated. But British authorities had already received word from their agents in Portugal to the contrary. 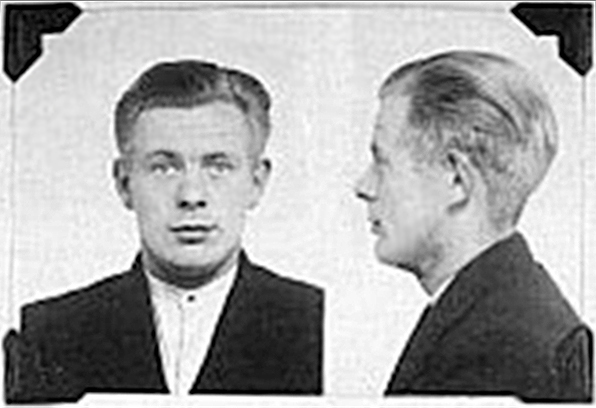 The details of Duncan Scott-Ford's arrest and trial had been kept secret until after his execution. The next day's papers reported that Scott-Ford had betrayed his country for £18, and lost his life in consequence, as a warning to other Merchant Navy sailors who might have been approached by Axis agents as he had. Russian Front - North: Day 422 of 872 of the Siege of Leningrad. Russian Front - North: Day 183 of 658 of the Siege of the Kholm Pocket, USSR lays siege to the Kholm Pocket but the Germans hold out for a about a year and a half. Russian Front - South: Day 129 of 150 of Germany's CASE BLUE, the failed offensive to take the Caucasus oil fields. Russian Front - South: Day 73 of 165 of the Battle of Stalingrad, bloodiest battle in human history. MTO - Egypt: Day 12 of 20 of the 2nd Battle of El Alamein. Down to just 40 tanks, Rommel's proposal to withdraw his Afrika Korps is rejected by Hitler, who orders him to stand and fight. East Africa: Day 183 of 186 of the Battle of Madagascar. CBI - China: Day 1,946 of 2,987 of the 2nd Sino-Japanese War. PTO - Alaska: Day 150 of 435 of the Battle of Kiska, Aleutian Islands. The US and Canada will defeat the Japanese invaders. PTO - Malaya: Day 258 of 357 of the Battle of Timor Island, a long guerrilla war ending in Japanese victory. PTO - New Guinea: Day 106 of 119 of the Battle of the Kokoda Track. The Australians continue pushing back the Japanese troops. PTO - Solomon Islands: Day 89 of 187 of the Battle of Guadalcanal. USA: the 1,000th B-24 Liberator heavy bomber comes off the assembly line at the Willow Run manufacturing complex in Ypsilanti, Michigan. 7,800 more will be produced at Willow Run by the end of the war. At its inception, the B-24 was very modern, with a higher cruise speed, longer range and the ability to carry a much heavier bomb load than its better-known counterpart, the B-17 Flying Fortress. While aircrews tended to prefer the B-17, General Staff preferred the B-24, and procured it for a wide variety of roles. The B-24 served in every branch of the US armed forces, as well as several Allied air forces and navies, and saw use in every theater of operations. Along with the B-17, the B-24 was the mainstay of the US strategic bombing campaign in the Western European theater. The B-24 was designed by Consolidated Aircraft of San Diego, California. Production took place at five plants at an astonishing rate throughout 1942 and 1943. Consolidated Aircraft tripled the size of its plant in San Diego and built a large new plant outside Fort Worth, Texas. More B-24s were built by Douglas Aircraft in Tulsa, Oklahoma. The North American plant B in the city of Grand Prairie, Texas started production of B-24G in 1943. None of these were minor operations, but they were dwarfed by the vast new purpose-built factory constructed by the Ford Motor Company at Willow Run near Detroit, Michigan. The Ford Motor Company's Willow Run plant used Henry Ford's mass-production techniques to build B-24 Liberators. 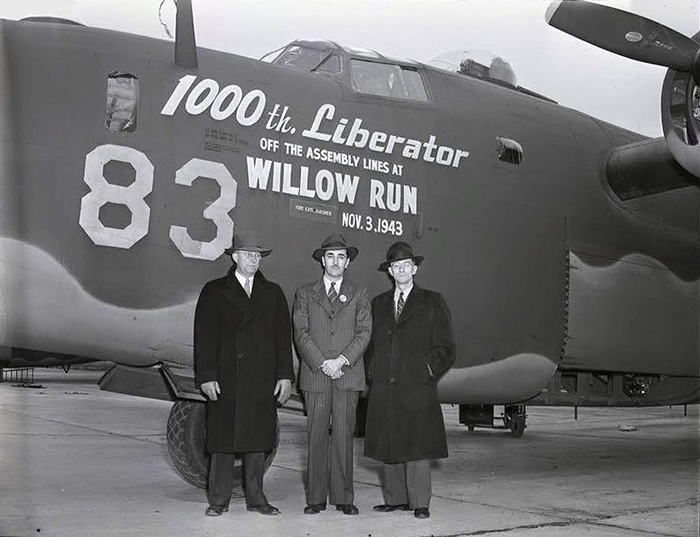 When it opened in 1941, expectations were high for Willow Run, which at some 3.5 million square feet was the world's largest factory under a single roof. The first B-24 came off the line in October 1942. Early on, however, the plant was plagued by such issues as labor shortages and earned the nickname "Willit Run?" The initial problems were later ironed out, as workers were recruited from the South, women were hired and employee housing was constructed. Willow Run eventually employed over 42,000 people and by 1944, the plant was producing one plane every hour. This astonishing rate of production by all plants meant that the USAAF could replace every bomber in a single bomb group in a single day, a feat Germany couldn't even imagine. In fact, it would take only two weeks to replace every B-24 in the entire US 8th Air Force. ETO - Germany: US 8th Air Force launches a daylight raid on Wilhelmshaven with 400 bombers and 600 fighter escorts. At night the RAF drops over 2,000 tons of bombs on Düsseldorf in 27 minutes. Poland: Nazis carry out Operation HARVEST FESTIVAL, killing 42,000 Jews. Russian Front - North: Day 787 of 872 of the Siege of Leningrad. Russian Front - North: Day 548 of 658 of the Siege of the Kholm Pocket. USSR lays siege to the Kholm Pocket but the Germans hold out for a about a year and a half. Russian Front - South: Day 72 of 122 of the Battle of the Lower Dnieper River, USSR. A massive Soviet offensive north of Kiev is launched. Russian Front - South: Day 1 of 10 of the 2nd Battle of Kiev, Ukraine. MTO - Greece: US 12th Air Force B-25s bomb the Araxos Airfield. MTO - Italy: US 12th Air Force provides air support for the US 5th and British 8th Armies. CBI - China: Day 2,311 of 2,987 of the 2nd Sino-Japanese War. Day 2 of 49 of the Battle of West Changde. PTO - New Guinea: Day 46 of 219 of the Battle of Shaggy Ridge. PTO - New Guinea: Day 43 of 162 of the Battle of the Huon Peninsula. PTO - New Guinea: Day 2 of 10 of the Bombing of Rabaul, a joint US, Australian and New Zealand carrier and land-based attack on the Japanese cruiser force at the naval base at New Britain. PTO - Solomon Islands: Day 3 of 295 of the Battle of the Bougainville Islands. ETO - France: Day 95 of 284 of the Battle of Brittany. ETO - Belgium: Day 33 of 38 of the Battle of the Scheldt Estuary. ETO - France: Day 50 of 236 of the Siege of Dunkirk. ETO - Germany: Day 46 of 145 of the Battle of Hürtgen Forest. Russian Front - Finland: Day 50 of 223 of the Lapland War. Finland and Russia have joined forces to kick the Germans out of Finland's most northern province. The German 20th Gebirgsjager Army evacuates the mineral rich Petsamo region of northern Finland. Russian Front - Center: Day 20 of 206 of the Battle of the Courland Pocket in Latvia. Russian Front - Center: Day 13 of 99 of the Siege of Memel, a border town of Lithuania and East Prussia. Russian Front - Center: Day 51 of 72 of the Battle into East Prussia and northern Poland. Russian Front - South: Day 6 of 108 of the Battle of Budapest, Hungary. Russian Front - South: Day 51 of 72 of the Battle of Belgrade, Yugoslavia. MTO - Germany: US 15th Air Force heavy bombers drop on targets in southern Germany. MTO - Italy: US 12th Air Force fighters attack gun positions in the mountains south of Bologna. CBI - Burma: Day 217 of 302 of the Chinese Salween Offensive in Burma. CBI - China: Day 2,677 of 2,987 of the 2nd Sino-Japanese War. Day 201 of 259 of Japan's Operation ICHI-GO. PTO - New Guinea: Day 312 of 597 of the Battle of New Britain. PTO - New Guinea: Day 196 of 481 of the Battle of Western New Guinea. PTO - Palau Islands: Day 50 of 74 of the Battle of Peleliu (Operation STALEMATE II). PTO - Philippines: Day 15 of 299 of the 2nd Battle of the Philippines, aka the Liberation of the Philippines or the Philippines Campaign. PTO - Philippines: Day 15 of 73 of the Battle of Leyte.